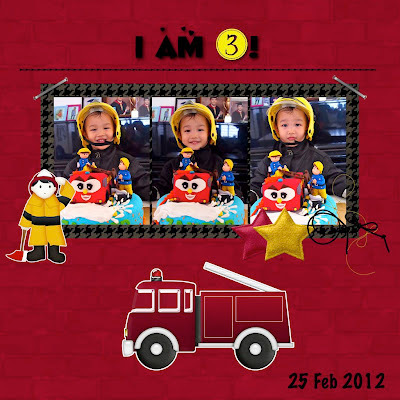 ♥ BabiesLZ ♥: My Little Firefighter is 3! My Little Firefighter is 3! 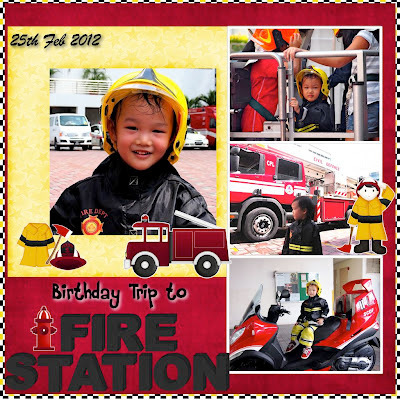 Beanie's 3rd birthday wish - A visit to the Fire Station! When they found out it was Beanie's birthday today, they were so sweet to go the extra mile to make it more memorable for him! I said that coz not sure does everyone get to do these on open house day?! 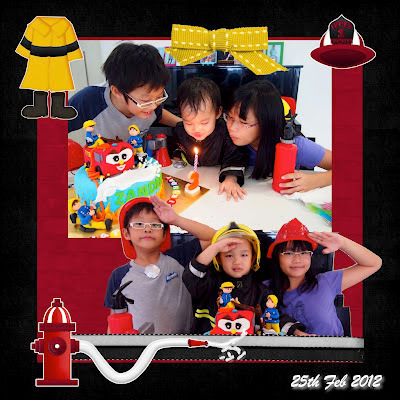 They sang birthday song for him and gave my kids lots of goodies, including fireman raincoats and 3 fireman helmets! A BIG THANK YOU to all the officers for making Beanie's birthday so special! Thank you all for spending time to explain to my babies and making it a wonderful experience for them! You guys were awesome! You didn't mind us staying beyond the open house timing and let them have more than enough time to explore around! I have to tell you what my kiddos said "you guys rocks!" For that few hours, we were able to experience so many FIRSTs! 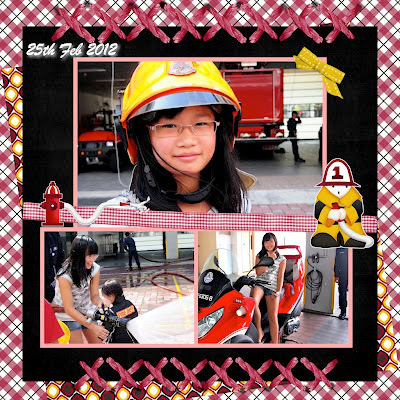 This was not L & Z first experience at a fire station but they told me they did not explore as many things as this time. 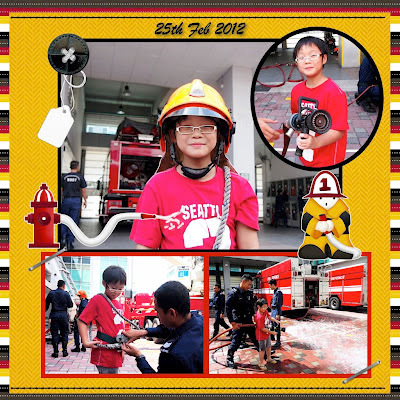 Of all the fire-fighting vehicles, they enjoyed the Combined Platform Ladder the most! They had the opportunity to see how it was set up, rode on it and went up a few metres high! 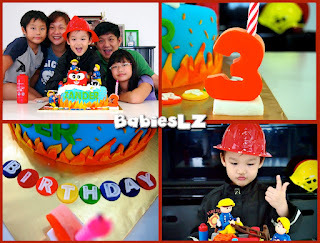 His next birthday wish - A 'fire cake' (fire engine cake)! It was a very BIG birthday cake! He was so excited when he saw his fire engine cake! 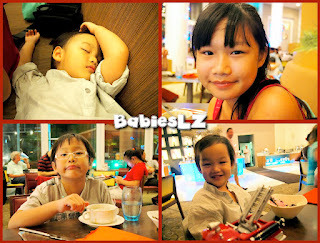 In the evening we went for buffet at Changi Village Hotel. Birthday boy dozed off on the way there and woke up later to have his meal. ♥ Love chatting with my little one, or rather, teasing him. His reply is often so cute! Especially when he sounds very serious when he replies me. Me: I'm so hungry! Can I eat you? ♥ Now that he goes to school, he has more things to tell me. Sometimes, the teacher tells me what they did and I will ask him. He has started learning alphabets & numbers. The other day they did a scavenger hunt and he was so happy that he found the number '1'. I'm not in the hurry to teach him more actually... I hope to teach him at his own pace and he feels like it. Looking at how much time his siblings spent on their work, I hope to let him enjoy as much as he can now. ♥ Besides fireman, Beanie likes policeman too. He gets excited when he sees one. Once (14 feb), after parking my car, we saw the police car patrolling our estate. He hurriedly got off the car so that he can waved to them. He also likes to explain to us what does a policeman or fireman do. "Policeman catch the bad guy. Fireman save the fire." 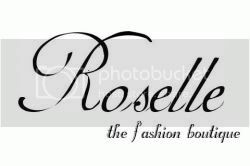 ♥ (15 feb) - Beanie gave us a shock today.... He said there's a baby in my tummy! ♥ For his milk feeding, he has make better progress now. I managed to wean him off for afternoon feed and sometimes night feed as well. I give him fresh milk instead. But during night time, I have to hide in the toilet so that daddy can put him to bed. Otherwise, he will give me his most pitiful look and I will give in. At times, he says "please" so many times that I give in too.